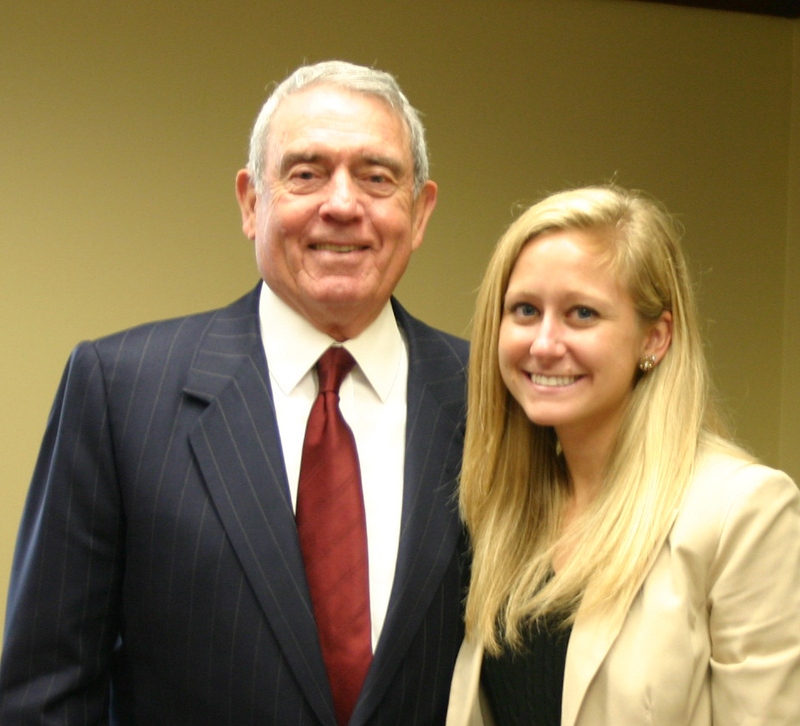 Last week I got to meet legendary journalist Dan Rather. I wasn’t nervous in the days leading up to the interview, but then an hour or so beforehand, I could feel my stomach start to turn. At the same time I felt as excited as a little kid on Christmas morning, and was reminded of why I love my job so much. I had spent a good deal of time researching Rather’s career as a journalist, and I had gone over the questions I planned to ask him with my editor, so I felt prepared. But I still couldn’t help but think: Rather has interviewed some of the world’s most powerful figures. He knows what a good interview entails, so you better make this a good one! I only had time to ask him five of the questions I had prepared, in part because he offered such detailed responses to each of them. Toward the end of the fourth question, Rather was called to the dinner that was being held at Poynter to honor him. Instead of rushing out of the interview, though, he said: “I’m going to let this young lady ask one more question because she was so patient while waiting for me.” So I asked him about social media — something he’s started to gain an appreciation for but doesn’t regularly use as a journalist. 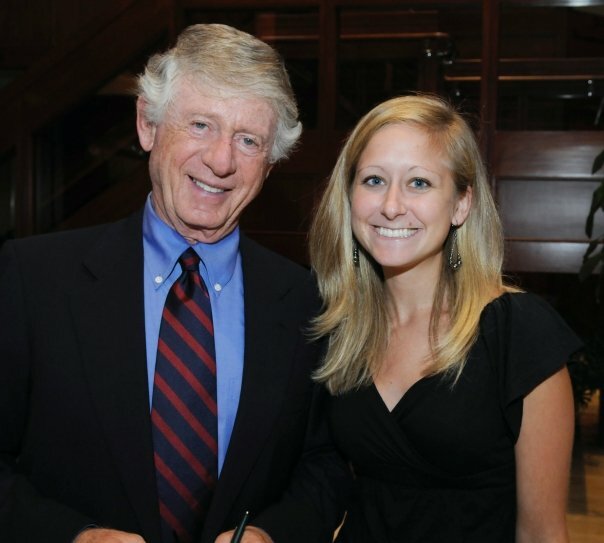 Me and Ted Koppel, who spoke at Poynter in September 2009. Not surprisingly, Rather shared many traditional views of journalism, but also seemed to see the promise in emerging technologies. His responses helped show just how much the industry has changed — and in some ways how it’s remained the same — since he began his career as a journalist in 1950. –Last year, you called upon President Obama to form a commission to help save journalism jobs and create new business models to keep news organizations alive. You’ve been vocal in recent years about the “perilous state of America’s news industry,” saying “American journalism is in need of a spine transplant.” What do you think is most at risk in today’s news industry? –If you could, how would you change evening network news? –You’ve criticized news ownership, pointing out that many news organizations are now run by large, corporate entities that have interests and agendas that run contrary to the interests of the public. Along these lines, you’ve said “the news stops with making bucks.” What do you think needs to be done to change this problem? And hasn’t news always, at least in part, been about ratings and money? 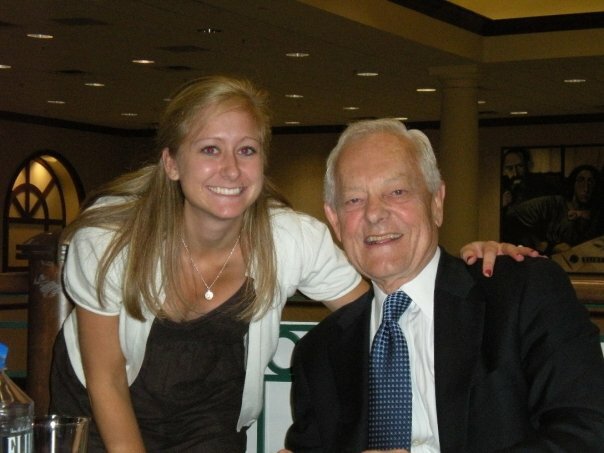 Met Bob Schieffer at a 2008 book signing in Dallas when I was interning at The Dallas Morning News. –You said in a Huffington Post story that until recently, you had no idea what Twitter was. “Much of what we tweet, or post, or chat away at under the guise of news, are distractions,” you wrote. Lots of journalists nowadays, though, use Twitter to report and disseminate stories. How important do you think social media is to today’s journalism? –In a Washington Post column last year, you wrote that newspapers are the foundation on which hard news rests. More specifically, you said: “The old news model is crumbling, while the Internet, for all its immense promise, is not yet ready to rise in its place and won’t be until it can provide the nuts and bolts reporting that most people so take for granted that it escapes their notice.” Can you say more about why you think the Internet isn’t ready to rise up to the old news model? What will it take for it to rise up, and do you think it ever will? –At the Democratic National Convention in 2008, you said the news is now filled with “so-called political debates, where the one thing assured not to happen is genuine debates and where the questions the public really cares about seldom seem to get asked.” What do you think needs to be done to improve political coverage? –Along these lines, how effective do you think PolitiFact, and other efforts to fact-check political news, are? 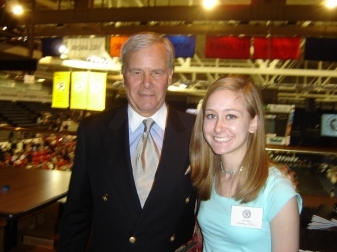 Me and Tom Brokaw, who was the Providence College commencement speaker in 2006, the year before I graduated. –You were a correspondent during the Civil Rights movement and have said that your desire to report on these injustices was one of the reasons you decided to become a journalist. What’s missing in today’s diversity coverage? –You’ve gone from anchoring a nightly news broadcast to managing a more niche show, “Dan Rather Reports,” on HDNet. On the show, you focus on international coverage and investigative stories. How do the stories you cover now differ from, or compare with, the stories you covered for CBS? –When major news stories break today, what are your first instincts? –What did you learn from the controversy over the Killian documents? –You said in a UC Berkeley interivew last year that you didn’t realize the power of bloggers until a group of conservative bloggers questioned whether the Killian documents were falsified. What role do you think bloggers play in today’s news media industry? –You’ve talked a lot about courage, saying “courage is being afraid but going on anyhow.” What makes a courageous reporter in today’s world? –What do you think would be a healthy “news diet” for consumers? What sources and resources should they turn to? –You’re known for some of your classic expressions, which I remember from the 2004 elections. (ie “George Bush is sweeping through the South like a big wheel through a delta cotton field”; “There’s no question now that Kerry’s rapidly reaching the point where he has his back to the wall, his shirttail’s on fire and the bill collector’s at the door”; “This presidential race has been crackling like a hickory fire for at least two hours”; and “John Kerry’s lead is as thin as turnip soup.”)… Your voice really comes through in those expressions. How important is it to have a voice as an “objective” journalist? –You recently traveled to Iraq to interview General Raymond Odierno, the commander of U.S. forces in the region. How is covering this war different from the other wars you’ve covered? –If you could interview one person, who would it be? What would you ask? –What’s been your most challenging story to report?